Richard Gillett’s hunger strike is over. His 11-day protest ended Sunday after paramedics were called in by his wife Joyce. 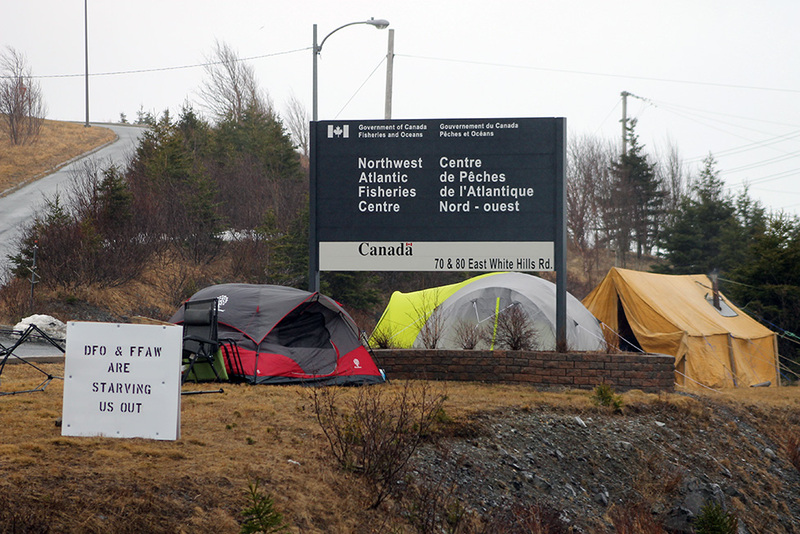 Gillett, vice-president of the Federation of Independent Seafood Harvesters (FISH-NL), has been camped out at the entrance to DFO’s head office in St. John’s since April 13. He has been asking for an independent review of DFO science/management, as well as an independent review of the relationship between DFO and the Fish, Food and Allied Workers (FFAW) union. CBC reported that he was taken by ambulance to St. Clare’s Mercy Hospital where he was checked out and later released and was resting at a hotel. FISH-NL President Ryan Cleary told the media that Gillett had lost more than 25 pounds but will be fine. More protests at DFO headquarters are expected this week. No Replies to "Gillett Hunger Strike Comes to an End"